Note the grade level is K-8. 2nd Annual Technique clinic and Takedown tournament. The clinic will be run by RCTC coaches and wrestlers, including returning All American Garret Miller, 3X State Champions Dakota Trom and Joey Munoz, along with all the other talented recruits and returning wrestlers. A majority of this will be instructional. At the end we will bracket up the wrestlers by size and age for a takedown tournament (T-shirts will be given to the winners). 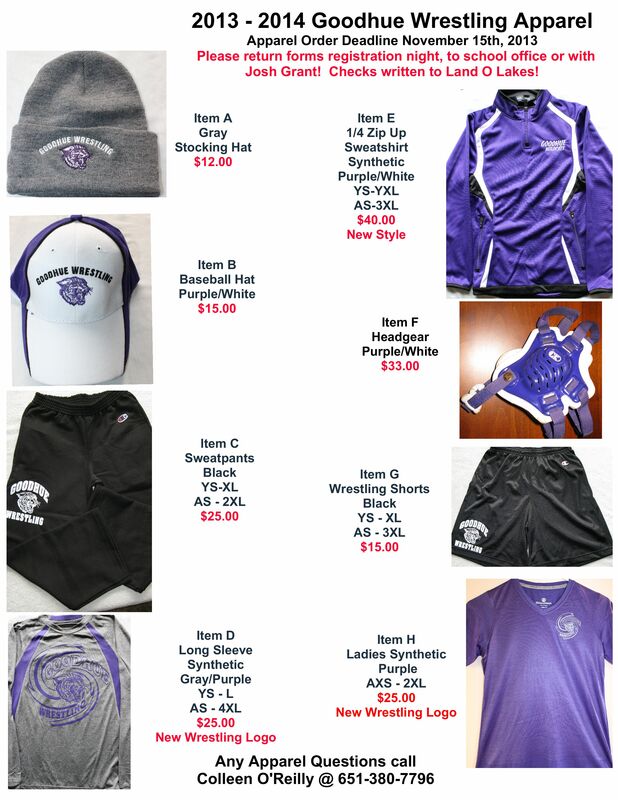 The 2013 apparel offering for Goodhue Wrestling is available now, and orders are due November 15th! Please remember to make checks out to “Land of Lakes Wrestling” and that payment is due when you submit your order. Many thanks to the Land of Lakes Wrestling Club apparel committee for preparing the offering again this year – Colleen O’Reilly, Nicole Miller, and Board Secretary Kim Goplen. Order forms are available here on the website via this post, and are also stored in the “Document Library” under the “Varsity” tab of this webpage. Also pre-printed forms are available outside the office or in Coach Grant’s room. Finally, you’ll be able to view and sample sizes at the Goodhue Wrestling registration meetings for both levels that will be the evening of November 13th. This year marks the 50th Anniversary of the Goodhue Wrestling Program! Goodhue Wrestling!!! There will be a program at the first home match this year – December 6th. This is for all previous Goodhue wrestlers, cheerleaders, and fans. *Friday October 25th 5:00 – 9:00 p.m. The Land of Lakes Wrestling Club will have another October meeting in Coach Grant’s room. This will be the evening of Wednesday, October 23rd at 7:00 p.m. The Land of Lakes Wrestling Club will have its Annual Meeting tonight (10/2/13) at 7:00 p.m. The meeting will be held in Coach Grant’s room. Preparation will begin for the upcoming 2013-2014 wrestling season for the K-12 Goodhue Wrestling Programs.